This is my review of the brand new Crowne Plaza London Heathrow Terminal 4 hotel. The Crowne Plaza London Heathrow Terminal 4 has just opened. 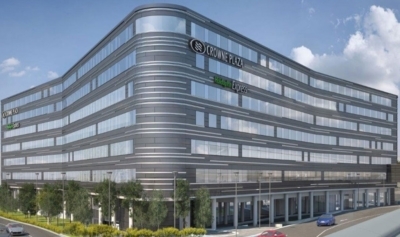 It shares a building with the Holiday Inn Express London Heathrow Terminal 4 and represents a chunky £80m investment by Arora Group, which also own the Sofitel Heathrow Terminal 5 amongst other properties. To put the hotel in context, at almost 700 rooms across both brands it is the largest hotel to open in the UK this year and the largest IHG hotel opening anywhere in Europe this year. IHG offered me a free night to take a look. As you will see tomorrow I also got a tour of the Holiday Inn Express part of the building, although I did not stay there. ‘Two in one’ hotels, where one building contains two properties owned by the same group, are becoming more prevalent. IHG has another opening at Heathrow in January, when a joint Staybridge Suites and Holiday Inn opens on Bath Road. There is logic to it – you can justify a bigger building on scarce airport land, and there are cost savings to be had behind the scenes. What varies from development to development is how closely the hotels are integrated. At Westfield Stratford, for example, a Holiday Inn (reviewed here) and Staybridge Suites share the same building but do not share facilities. In contrast, this new Terminal 4 development is the most integrated I have ever seen – only time will tell if the Crowne Plaza suffers because of this, because you can pay £35 less for a Holiday Inn Express bed and still use the same restaurant and bar, plus get free breakfast. I’m getting ahead of myself though …. You access the hotel via the Departures level at Heathrow Terminal 4. (Don’t go to Arrivals if arriving by tube or train.) If you have ever stayed at the Hilton Terminal 4 (review) or Premier Inn Terminal 4 (review) you will know the gangway that leads from the terminal to the hotels. If you taking the tube from Central London, make sure you get a Terminal 4 train and not a Terminal 5 one. If you take the Heathrow Express, you need to change at Terminal 2/3 for the TFL Rail train to Terminal 4. Alternatively, get the TFL Rail (ex Heathrow Connect) service from Paddington in the first place. Getting to Terminal 5 is a bit messy, unfortunately – it is also a quite a distance if you look at a map. You need to take the train or tube via Terminals 2/3. Other options are the Hotel Hoppa bus or bus number 482 or 490 from bus stop 7 (free service). The hotel can also order you a taxi. The Crowne Plaza Terminal 4 is the first hotel on the gangway. You save a couple of minutes compared to walking to the Hilton or Premier Inn. There are not huge, however, and there isn’t a lot of difference in terms of space between the two hotels. The little things are all there – individual reading lights, USB sockets by the bed, a variety of pillow types, a robe in the wardrobe etc. The standard rooms only sleep two people. For a family, I would recommend a suite which is about 75% more expensive than a room but has a capacity of four people, as long as two are children under 12. The room came with a fruit bowl and a small box of chocolates. There was no coffee machine in the standard rooms, which is a shame as it would have been a good way of creating more differentiation with the Holiday Inn Express. However, if you book a ‘Business’ room for an extra £20 or so then it appears that you do get a Nespresso machine and a Bluetooth speaker system. In a standard room you get a kettle, two packets of biscuits (yeah! ), tea, coffee and two free bottles of water. If you need to work, this is where the Crowne Plaza scores over the Holiday Inn Express with a good sized desk complete with power sockets and a decent light. Wi-fi was free and of excellent quality, as you’d expect from a new build hotel. The bathroom had some snazzy silver tiling. There was only one sink. Toiletries were the standard Crowne Plaza ‘this works’ brand which I find fine. 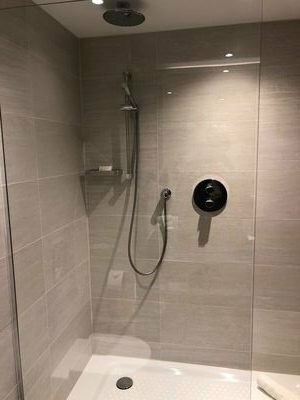 You get a big shower – wider than the picture shows – with a choice of rainfall or traditional water jets. It goes without saying that soundproofing is EXCELLENT. I did not hear any aircraft noise at all. In terms of views, some rooms – including mine – directly face the Hilton Terminal 4 across the road (which is quite an impressive bit of architecture by airport hotel standards) whilst others face towards the terminal. Some also face inwards over the atrium. Let me show you how it looks inside. The hotel is rhombus shaped. Whilst both the Crowne Plaza and Holiday Inn Express have their own check-in areas and receptions, they share the lift bank. Not only that, but each floor has a mix of Crowne Plaza and Holiday Inn Express rooms. You walk out of the lifts and turn one way for the CP and the other way for the Holiday Inn Express. This is a view from the 4th floor, where I was, looking down on the Crowne Plaza lobby cafe which has a surprisingly good cake selection! Below is the bar. This is an interesting arrangement. The Holiday Inn Express side of the ground floor – the areas are separated by the lift lobby – has its own bar / restaurant which serves drinks and a standard Cafe Rouge-style food menu. There is also, behind the lifts, a stand-alone bar with two doors – one on each brands ‘side’ of the ground floor – which is pictured below. Whilst decoratively it looks more like the Crowne Plaza, it is open to all guests. The General Manager, Andrew Brown, gave me a tour of the hotel. When we went into Urban, the main restaurant (on the Crowne Plaza side but usable by guests at either brand) he told me what a great team of chefs he had assembled and how impressed he was by the food. This is, of course, what you’d expect him to say! I got a shock though. I had the best meal that I have ever had in an airport hotel. It was very good. If you are looking for a Heathrow hotel where you can eat well, in particular if you are meeting a client, I strongly recommend the Crowne Plaza Terminal 4. There WILL be an Executive Lounge at the hotel, but it will not be open until January 2019. There are a couple of other facilities worth mentioning. There is a gym in the basement. This is ONLY for Crowne Plaza guests, so don’t book into the Holiday Inn Express side if you want to exercise. There is a meeting room on lobby level which can be booked even if you are not a guest. Finally, a few shots from breakfast. There is a decent spread including a cook who can rustle up eggs and various other made to order items. I’ve never seen so many pots of jam on a buffet! The Crowne Plaza London Heathrow Terminal 4 is an impressive property. As a brand new hotel – it even still smells new – it is obviously in excellent decorative order and has the high quality wi-fi, plethora of plug sockets and modern shower that you’d expect. What you don’t always expect from a brand new hotel is good service and a fine-tuned restaurant, but I’m pleased to say that everything is working well in those areas too. It is plusher and a little cosier than the adjacent Hilton – and you save a couple of minutes each way walking to and from the terminal. The Hilton Terminal 4 has a lounge, of course, which may swing it for Hilton Diamond members, but the Crowne Plaza will have its own lounge space from January. We need to see if Spire Elite members are given free access. Tomorrow I will share a few thoughts on the Holiday Inn Express which shares the building. Cash rates at the Crowne Plaza Heathrow Terminal 4 start at £110 for advance booking (room only) for midweek dates in December / January. This is about £35 more than the Holiday Inn Express and you will get free breakfast there. For points, the Crowne Plaza is 30,000 points per night which – at my notional 0.4p valuation – is about right. The Holiday Inn Express is 20,000 IHG Rewards Club points per night. Thanks to IHG for arranging my stay and for Andrew Brown and his team for showing me around. The hotel website is here if you want to find out more. You can compare and contrast with the Holiday Inn Express Heathrow Terminal 4 website which is here. With 2 in 1 properties you need to check you’re getting credited with two stays if you’re staying at both properties. They usually share the back offices and you could end up being credited with just the one. There’s a Holiday Inn Express right next to a Crowne Plaza at Aberdeen Airport. They’re separate buildings, but they are identically shaped on the outside apart from different branding. They often have the same room price as each other, and even if they don’t the Crowne Plaza is seldom more than a few quid more than the HIE. The pull of “posher brand” against “free breakfast” seems to be about equal. There are way too many hotels at Aberdeen Airport for the current level of business, though, so it may be an unusual case. Given that the vast majority of hotel restaurants and/or hotel bars are perfectly happy to serve any random person who comes in – hotel guest or not – it’s pretty much inevitable that the guests of both hotels are going to use both sets of facilities, I would think. Don’t you like HIX rehydrated scrambled eggs and overcooked bacon? Just checking out the price for 2 adults and 2 kids in both hotels on a Saturday night; the CP is £141 per night, the HIX £63. Given you get free brekkie in HIX, it’s brand new and you share the bar area, it’s a no brainer. If CP was a step change better, but at nearly £80 difference, I don’t think so.